Playtech hit the nail on the head when naming the Jackpot Giant slot. 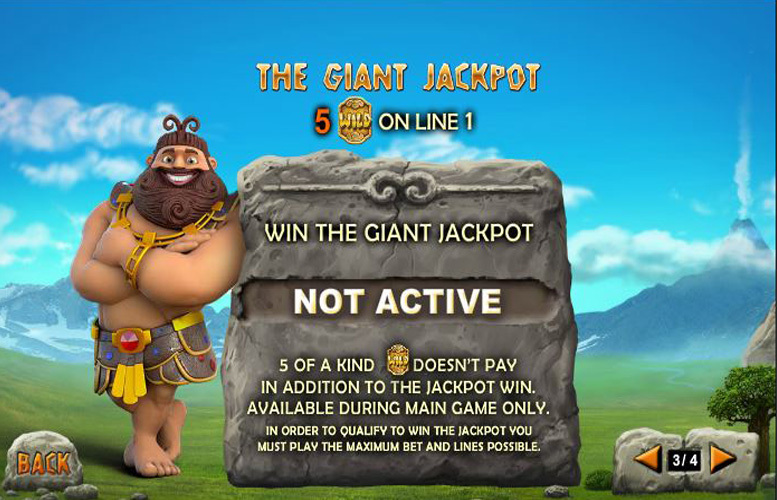 Not only are there giants, and jackpots, but there’s also a particularly giant jackpot up for grabs. That’s right, this one’s a progressive jackpot machine which has the capability of rewarding players with a truly lifechanging sum of money. The machine itself is quite traditional in its looks – five reels, and three columns. The art style is bright and cheery, and this benefits the longevity of the gameplay. Players who enjoy cartoony slots, with huge potential prizes will likely enjoy passing the time on this machine. Progressive jackpot. The inclusion of a rarely won, cumulative mega prize is a nice touch that really adds to the excitement of the game. It might be incredibly unlikely but the potential to win a six-figure sum certainly increases a players’ enjoyment factor. The art style is cheery, bright and engaging. The land of Giant Jackpots is almost as pleasing to look at as it is to explore. A massive fifty possible pay lines. This increases a player’s chances of winning big, and any time our odds improved, we’re smiling. There’s no free spin bonus. The game seems a little too focused on its progressive jackpot feature. This isn’t a problem if you’re only playing for the chance to win huge, but for those who enjoy many smaller wins, they might find the lack of additional bonuses limiting. Wild = 50,000x the line bet. Handful of coins “Scatter” = 500x the line bet. Pink gems = 500x the line bet. Blue gems = 300x the line bet. Yellow gems = 200x the line bet. Using the above values, and having the line bet set to the maximum (8p), players stand to win up to £4,000. This isn’t even the progressive jackpot win – Giant Jackpots is clearly more than just a clever name. Without a doubt, the most exciting special feature on this machine is the huge progressive jackpot on offer. Unfortunately, the method of winning this isn’t particularly exciting, and perhaps the lack of stimulating bonuses is the slot’s major weakness. Hitting five-of-a-kind “wild” symbols across the number one (central) pay line earns players an absolutely lifechanging sum of money. 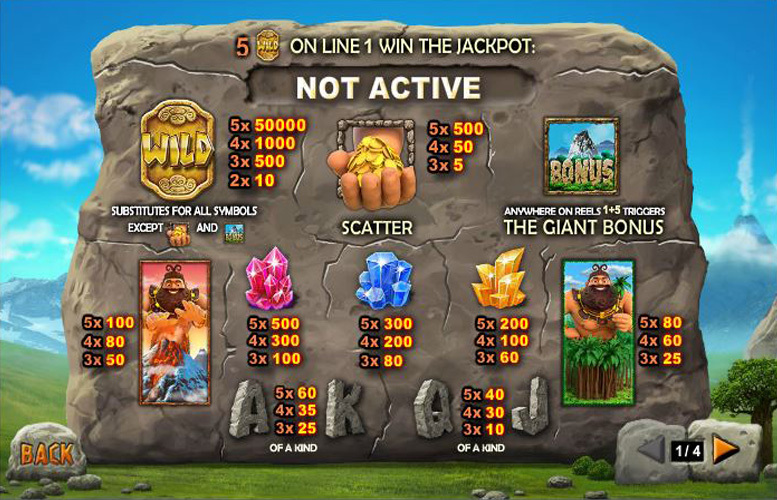 This is courtesy of the game’s progressive jackpot feature which players will see continually scrolling up at the top of the reels during the main game. 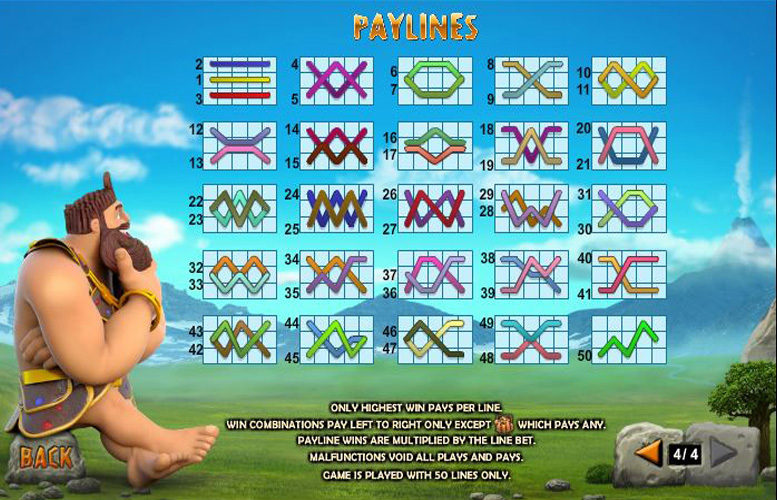 By landing the “Bonus” symbol anywhere on reels one and five simultaneously, players will trigger the “Giant Bonus”. 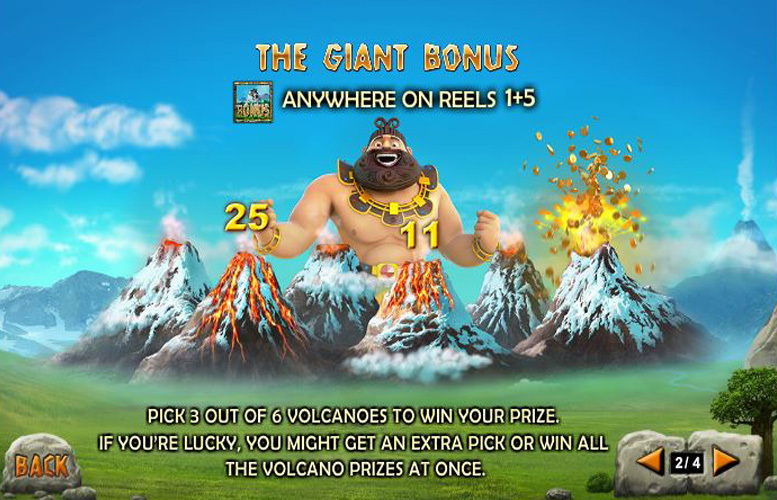 During this feature, players pick three out of six volcanoes to win prizes. If they’re particularly lucky, they may uncover an extra pick, or even a “win all” prize. Stacked red giant = 100x the line bet. Stacked green giant = 80x the line bet. Ace, or King = 60x the line bet. Queen, or Jack = 40x the line bet. To play for the progressive jackpot, players must be betting the maximum per spin. Don’t worry though, this isn’t the four-figures of some modern slot machines. As the highest possible line bet is 8p, the maximum cost per spin is £4 (8p x 50 lines). The minimum possible bet per spin is 50p, as there is no option to adjust the number of betting lines played on this machine. 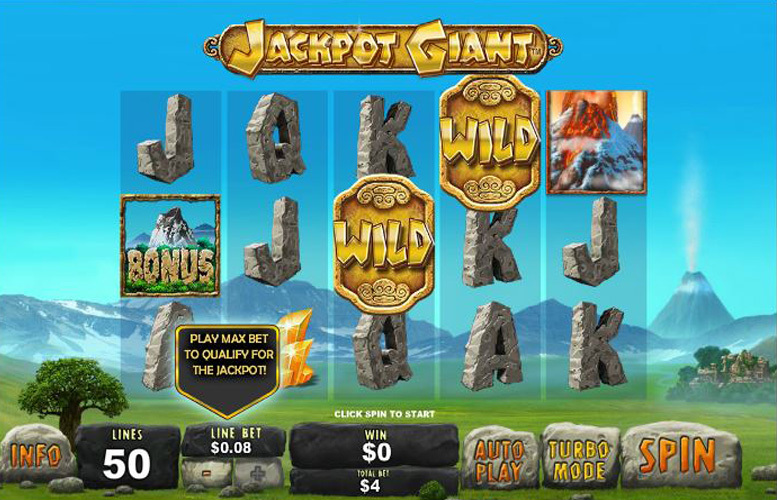 Jackpot Giant is a machine that is completely geared around its progressive jackpot. Whilst players seeking the kind of game that can pay a few hundred pounds here and there might be disappointed, those dreaming of true riches will love the opportunity to play for six-figures. In terms of playability, the inclusion of a progressive jackpot limits the slot’s diversity. It does however look great, and fans of bright cartoony looking characters, and lusciously designed back grounds will likely enjoy the game. This game has a rating of 4 / 5 with 564 total reviews by the users.